Once upon a springtime in a magical garden, three saplings were planted in a row, along the bank of a sapphire lake. They were barely more than sticks, standing awkwardly in the sandy ground with their branch-arms raised toward the sky. All three looked alike, and they shivered together in their nakedness. As the spring sunshine kissed their branches, tiny leaves unfurled. The first sapling clothed itself in emerald stars; the second in peridot hearts; but the third sapling's leaves were barely even green, more of a sickly yellow, and shaped like common ovals. The first two saplings waved their branches joyfully in the spring breezes, dancing proudly in their green garments. The third sapling stiltedly danced along, pushing aside the jealousy under its tender young bark. The days passed, and the first two saplings exploded like fireworks with brightly colored blossoms. The first sapling's emerald gown glowed with silky petals as pink as a sunrise; the second sapling gleamed with velvety petals as purple as twilight. The third sapling burned with shame when its own branches burst forth in blossoms black and spiky, a blight upon its already homely branches. The first two saplings' leaves rustled in the wind, softly laughing. Spring matured into summer, and gaudy springtime blossoms fell away. The first two saplings mourned their pretty colors, but the third was glad. It thought nothing could be worse than waltzing through spring in funeral black. Then the saplings developed their first fruit. Ruby red apples; glittering garnet cherries; and pale white orbs. The third sapling didn't even know if its orbs were fruit. Their skin felt brittle rather than supple. When the gardener came to check on the saplings, pour water on their parched roots under the heat of the summer sun, and gather their fruits, she filled her basket with cherries and apples. She knocked on the third sapling's pale globes and listened to the hollow sound they made, but none of them rated a position in her basket. None of them touched her lips. The sight of the gardener eating the apples and cherries soured inside the third sapling's trunk. It could think of nothing else. If it couldn't be a fruit tree like them, it didn't want to be a fruit tree at all. A strong wind blew from over the lake, and the third sapling shook its branches in rage, rattling its pale brittle orbs until one by one they fell on the ground and cracked open. Fuzzy baby birds poked their beaks through the cracks, wiggled out of the broken orbs, and stretched their wings in the sunlight. The downy gray hatchlings squawked and cheeped in hunger, but not for long. The wind gasped through the branches of the other saplings, shaking down cherries and apples for the cygnets to eat. The third sapling didn't care about the other saplings' surprise. Its peculiar fruit had been eggs all along. It knew who it was now and held up its ugly yellow leaves with a quiet pride. Over the final months of summer, the third sapling watched its cygnets grow into swans with pearly feathers; they glided over the sapphire lake and gobbled up all the windfall fruit from the first two saplings. At night, they roosted under their mother tree, nestled against its slender trunk. 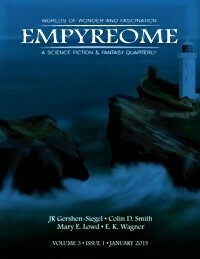 Mary E. Lowd is a science-fiction and furry writer in Oregon. She's had more than eighty short stories published, and her novels include "Otters In Space," "Otters In Space 2: Jupiter, Deadly," and "In a Dog's World." Her fiction has won an Ursa Major Award and two Cóyotl Awards. She's also the editor for FurPlanet's anthology series, ROAR, and the furry e-zine, Zooscape. 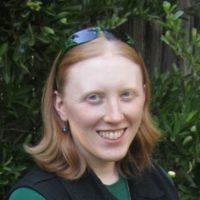 Learn more at www.marylowd.com or follow her tweets at @Ryffnah.